[Sebastian] is learning Morse code and CW radio, and of course he needed a telegraph key. Instead of using the terribly unergonomic paddle style key, he built a capacitive touch iambic key over the course of a few evenings. An iambic key usually has two switches. When one switch is closed, it will transmit a ‘dit’. When the other switch is closed, it will transmit a ‘dah’. 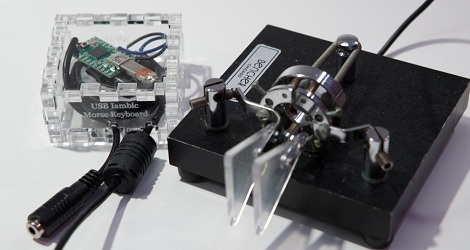 Instead of using mechanical paddles, [Sebastian] brought his iambic key into the 21st century by using a touch sensor. 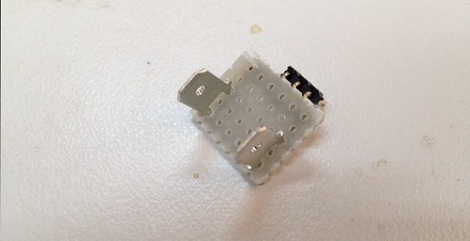 An ATtiny45 measures the time it takes for a single metal plate to fully charge. It’s the same idea behind the wonderful Arduino CapSense library. This isn’t the first capacitive-touch iambic key we’ve seen; this little guy is just a pair of metal contacts and resistors that plug right into an Arduino. With an ATtiny45, [Sebastian]’s build is a full-blown iambic telegraph key that plugs right into his CW rig. You can check out the walk through of the project along with [Sebastian] trying out his iambic key after the break. Hackaday has seen dozens of Morse code keyboards over the years, but [Hudson] at NYC Resistor finally managed to give that idea the justice it deserves. He built a USB Morse code keyboard with the same type of telegraph key the pros use. 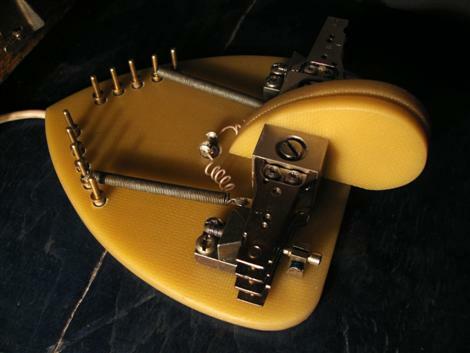 For his project, [Hudson] got his hands on a wonderful iambic paddle that is usually hooked up to CW rigs. Unlike previous Morse keyboards we’ve seen, [Hudson] used iambic paddles, a telegraph key with one lever for dits and another for dahs. Because the dits and dahs are separate electrical connections, it’s extremely easy for the microcontroller – a Teensy – to parse the Morse code and send the correct letter to the computer. [Hudson] also added some audio feedback for the dits and dahs, and designed a laser-cut enclosure for the Teensy and speaker. Check out the video of the iambic keyer keyboard in action after the break.